No one ever promised us that SCUBA diving would always be all smooth sailing, that’s why we took classes. That’s why we review the text book before our trips. However all the prepping can’t prevent issues with rental gear. We decided to take it slowly with our investment into our own SCUBA equipment and only purchase a few things at a time. The rest we rent from our outfitter, usually the stuff is fine but heavily used. Well poor Josh got the short end of the functioning gear stick this time. On our first three dives he experienced issued that could have been bad had he not remembered his training. On our first dive the tank came lose from Josh’s BCD, when he knew something was wrong he signaled me to look and come fix it. On our second dive his regulator, that wonderful device that allows us to breath underwater, started to “free flow”. Air was pushing through the mouthpiece without Josh drawing it in. This can shorten a dive by draining the tank and there is a constant flow of bubbles in front of your face. After trying what he knew to fix it, he signaled the dive master and they were able to get it back to normal. Neither of these issues are life threatening but scary. However on our third dive something a serious did happen. The needle on his air gauge got stuck, he didn’t notice at first. The reading was matching his accent and air usage. While at a safety stop to “off gas” he knew something was wrong. The gauge hadn’t moved and his air was dragging in. Quick thinking, he signaled the dive master and hooked up on backup air to safely make his assent. After we were back on the boat, his gauge read correctly. His tank was empty . We are enjoying our dives even after these issues and nothing else has happened. The photo above I shot with my camera using a borrowed housing. I’m thrilled at how these early attempts are coming out and know they will only get better from here. 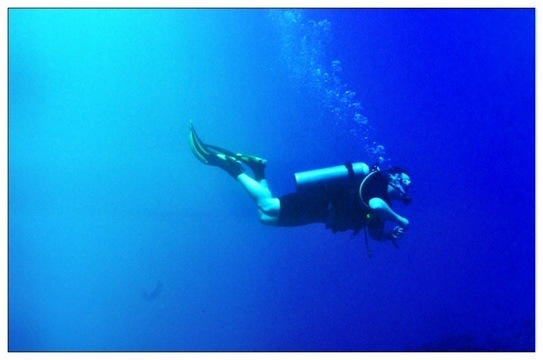 This entry was posted in Scuba Diving and tagged Cozumel, scuba diving. Bookmark the permalink. fantastic shot. Josh has had a few scares. At least he’s getting experience for future dives. Wow – those are some scary situations! I’m glad you and Josh are having fun and staying healthy. That’s why I never dive with anyone else’s regulator or BC…the rest you can rent, but those two little ditties are too too too important. Glad you got it all worked out, though.